Delicious, flavorful meatloaf for your crock pot! This recipe is altered from one found in Gooseberry Patch’s Slow-Cooker Christmas Favorites. 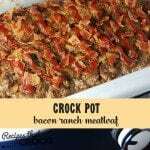 For this delicious Bacon Ranch Meatloaf, I used my new 9 x13 casserole slow cooker made by Crock Pot. As you can see from the pictures, it worked beautifully! If you don't have one of these awesome new crocks, you will want to use at least a 5 or 6-quart crock since it is so large.